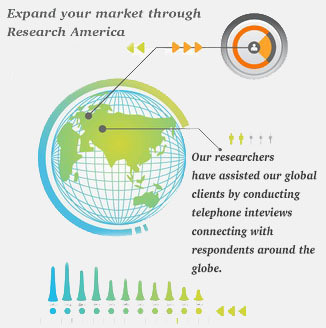 In addition to domestic research, Research America performs International Market Research. We deliver English and bilingual data collection and survey services for multinational corporations conducting US household interviewing in languages other than English, and assist any organization with a global reach. More companies are doing business internationally, and our research team offers high quality international market research conducted in your target market’s languages. We can help you through interviewing respondents in a single territory, or develop a multi-national study. Research America develops and fields all research in-house, using our multilingual interviewing staff. Our physical presence in multicultural metropolitan areas helps us hire interviewers who are fluent bilingual speakers of English and your studies’ target languages. We operate large, multilingual telephone interviewing facilities in our Philadelphia and Sacramento locations, and can expand multilingual and international time zone interviewing to several select locations. Your business can take advantage of opportunities to expand your market through Research America’s expertise in data collection, analysis and dissemination applied to international, multilingual studies. iOur ability to develop, conduct and design research for a diverse global marketplace will help your marketing team interpret and integrate complex data from diverse sources and environments as you build your global marketing strategy.